Female-fronted, New York-based punk rockers Tiger Piss are coming through Nashville on the tour to support their new party record Alcholiday and they’re bringing “Queen of the Slide Guitar” Skye Paige with them for a night of the girl power rock and roll that I’m so fond of telling you about. Locals biker string band Whiskey Hill Swillers and alternative country singer-songwriter Gabe Zander will join them and give you a version of country music you won’t find on Broadway at Springwater Supper Club tonight. 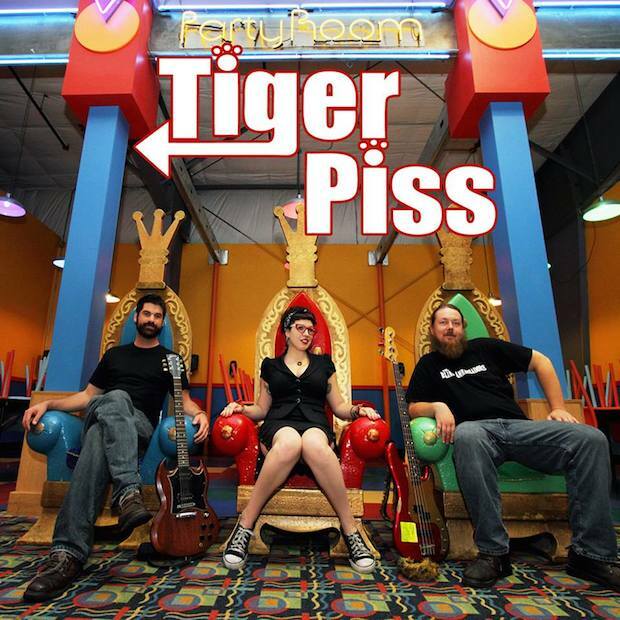 Tiger Piss are a female-fronted punk band from Kingston, New York in the middle of a tour to promote their fourth album, Alcholiday. As that record title would suggest, the group doesn’t take itself too seriously and believes in putting the fun back in rock and roll. They’ve partied and self-promoted their way through eleven national tours with frontwoman Lara Hope’s blues-belting making their fun-punk stand out from all that other fun-punk. Skye Paige is the self-described “queen of the slide guitar,” though it seems she’s earned the title through being a two-time champion of the Crossroads Guitar Competition and winning the House of Blues Battle of the Blues. She’s touring with Tiger Piss to promote her new double album What YOU Want, which features hard blues rock on side one and country blues on side two. Whiskey Hill Swillers combine outlaw country with punk rock and bluegrass instrumentation. Picture a bunch of tattooed bikers that decided to form a string band. Tiger Piss, Skye Paige, Whiskey Hill Swillers, and Gabe Zander will perform Thursday, November 13 at Springwater Supper Club. The show is 21+, begins at 10 p.m., and tickets are available for $5. Jacqui is a Nashville-based music writer who digs contemporary reinterpretations of the delta blues, alt-country, punk, feminism, and the traditional music of the American South. You can reach her at [email protected] or on Twitter @JacquiSahagian. Twin Shadow To Play Exit/In On September 25th!